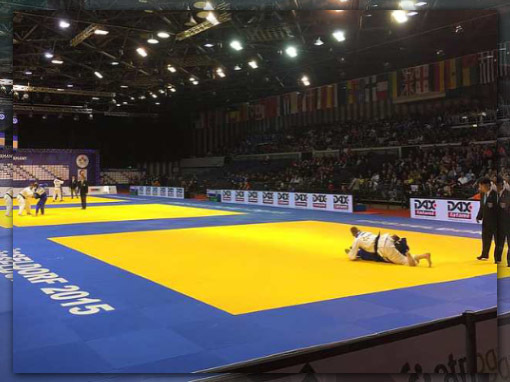 BSW tatami & MMA mats have been used worldwide at international championships since 1972, including the Olympic Games, World Championships and European Championships. The mats are phthalate free and are available in numerous traditional and trend colours. The mats are sealed with man-made fabric covers and welded seams, meaning no moisture can damage the foam core. The mats remain firmly in position without the use of joining tape or velcro. BSW Judo & Martial Arts Mats remain fully functional for many years, even under intensive use. The highly abrasion-proof surface prevents wear. This mat combines reliability, performance & long service life while offering the perfect balance between firmness & impact protection. Impact heights of up to two meters are possible during combat, so reliable impact protection is one of the most important factors when selecting JUDO & MMA mats. The mats lie securely without slipping, and the rice-straw textured vinyl cover is ideal for bare-foot combatants. For lying techniques, the mat cushions impacts and offers sufficient resistance to support fast movements. The BSW MMA mat is covered with a non-slip textured vinyl surface to avoid burns in cases where the traditional Gi (uniform) is not worn. The underside of the BSW MMA mat consists of BSW Anti-slip material, so that the mats remain firmly in position. The fabric is easy to clean. The training mats are used on all surfaces for learning and training, while also being highly valued by advanced athletes. Phthalates are chemical compounds used as softeners in the manufacturing of plastics, and are present in some low quality Judo / Martial Arts Mats. Investigations have revealed that phthalates can have negative impacts on human health. That’s why the cover fabrics on BSW mats are phthalate free. This is confirmed by test results conducted by the eco-institute in Cologne, where BSW products are tested for the most common phthalates.